Multiply your speed and reliability by bonding internet services provided by Skyway or other ISPs into a single connection sharing one IP address block. Critical services like VoIP and VPN remain online if one service drops. Skyway West SD-WAN Bonded Internet services include unlimited monthly data traffic. All Skyway West Bonded Internet services now include Unlimited Data! Bonded services can be used to build a private network as well as provide Internet access. Contact sales@skywaywest.com or call 604 482 1225 for more information. Bond Skyway DSL services together or with third party services to create a single connection with an upload and download speed up to 80% of the combined speeds depending on each connection’s latency and packet loss. Bond up to seven services. For Network Diversity, add your own (non-Skyway) internet service to any bond for $60/month per service. There is also a $100 extra install charge for each service. Separate services are sent through separate connections. For example, services sensitive to congestion (e.g., terminal server, Citrix, VoIP) are sent through one connection and less sensitive services (e.g., web browsing, email, ftp) through another. The services are load balanced by session or bandwidth utilization. Session balancing sends each session through a different connection. Bandwidth balancing sends all traffic through a specific connection until a certain percentage of the connection is utilized. At that point, the second connection is used. True bonding is when the combined bandwidth of two or more WAN connections is available to any application. For example, downloading a large FTP file would use multiple connections simultaneously. As well, true bonding allows for failover within the bonded connection allowing applications like VoIP and RDP using the failed connection to continue uninterrupted. Skyway offers a true bonding solution which dramatically enhances the speed and reliabiliity of your broadband connection. We combine multiple Internet access services provided by Skyway (e.g. dsl, cable, T1, fibre or fixed wireless) or by other providers and can apply compression to further accelerate upload and download speeds. Our Bonding solution combines multiple Internet connections using different IP addresses into a shared connection using a single IP address block. Inbound and outbound traffic only slows down if an individual Internet service fails. VoIP and terminal services stay connected. Bonding is a service that bonds multiple Internet access services provided by Skyway or other providers. For example, an DSL service, a wireless service and cable service. Bonding increases your download and upload speeds by combining multiple Internet services into a single connections. For example, increase your download speed to 24 Mbps and upload speed to 4 Mbps by combining four 6/1 DSL services. Or, 50 Mbps down and 10 Mbps up by combining two 25/5 DSL services. Bonding provides no loss failover meaning your Internet access continues uninterupted if one service fails. In addition to aggregating Internet traffic, we can prioritize different types of traffic (QoS) and can also apply compression to typically double the upload speeds of uncompressed data. Actual speeds may vary due to overhead and the amount of latency on each connection. Skyway supplies an Internet Bonding Router that connects to the router/modem supplied by us or by another ISP. The Aggregators have a 100 Mbps ethernet port for connection to your firewall or local area network. The Bonding aggregator equipment at your location connects your multiple Internet connections to a Bonding Aggregation Concentrator located at Skyway’s network operation centre. The Aggregation Concentrator passes the aggegated traffic to/from the Internet or to/from locations served by Skyway. DOES BONDING PROVIDE INBOUND/OUTBOUND FAILOVER? Yes, Bonding provides inbound/outbound failover. Bonding combines up to seven different Internet connections into a single connection sharing the same IP address block. If one Internet connection fails, the remaining connection(s) continue using the shared IP addresses without interrupting inbound and outbound traffic. If you have four connections, three can fail without loss of service. DO I LOSE VOIP CALLS OR TERMINAL CONNECTIONS WHEN BONDING FAILS OVER? No, VoIP calls or terminal connections do NOT drop when an Internet connection fails. People using VoIP will lose a moment of communication but their VoIP call will not disconnect. Those using a terminal or citrix connection might notice a short delay but they will not have to reconnect. Bonding can be enhanced to provide bi-directional QoS between your location and the Bonding Concentrator located at Skyway’s network operation centre. Bi-directional QoS manages Internet connections from different suppliers to allow inbound and outbound QoS. We can also provide bi-directional QoS between multiple locations. QoS increases overall performance and reliability for mission critical applications such as voice, video and data. Bonding supports Priority Queuing using IP Precedence, IPToS, DSCP and Custom Classification methods. For example, when there is insufficient bandwidth over an outbound connection, Priority Queuing will send the packet containing the highest priority queue first and then send the next priority packets. VoIP Packets can be assigned the “High” priority. Bonding can be enhanced to compress traffic between your location and the Bonding Concentrator located at Skyway’s network operation centre. Compressing the traffic reduces the time required to transmit the data across the Bonding, permitting more data to be sent in a given time. Bonding will compress any data that is not already compressed by the application. For example, common html pages, email and email attachments, spreadsheets, word processing documents, presentations and machine to machine data outside of a VPN are all typically compressed by Bonding. It will not compress traffic already compressed (e.g., most VoIP calls, photos, multi media files) or secured traffic it cannot identify (e.g., within a VPN). Compression typically doubles the upload speeds of uncompressed data. Bonding can be enhanced to terminate IPSEC VPN connections eliminating the need for a separate firewall. Skyway manages and monitors the VPN connections. The Bonding Aggregator also has a built in PPTP VPN server which can be configured to slave off a customer’s radius or active directory server. This allows a roaming user to connect their laptop to the office by pointing to the local aggregator without changing their PPTP login and password. HOW CAN BONDING HELP MY BUSINESS? If you require more upload speed, but are located in an industrial park limited to 6/1 DSL, bond four services to achieve 24/4. If your business relies on mission-critical applications, bonding provides uninterrupted no loss failover. If you need speeds typically associated with Fibre, but can’t afford the sometimes prohibitive construction costs and monthly charges, bond four 25/5 DSL services to achieve 100/20. If you require both no loss failover and provider redundancy, bond different technologies from different ISPs. Actual speeds will vary due to overhead and the amount of latency on each connection. Bonding is available throughout British Columbia (BC) and Alberta (AB). Please email sales@skywaywest.com or phone 604-482-1225 for more information. Skyway guarantees Bonding customers using more than one Internet technology 100% uninterrupted transit to the Internet. If transit to the Internet becomes unavailable, Skyway will refund the customer an amount equal to one day of the customer’s pro-rated recurring monthly Bonding charges during the month the interruption took place. If transit to the Internet is unavailable for a cumulative period exceeding one hour, the customer will receive an additional refund of one day of the pro-rated recurring monthly charges for each additional hour, or portion thereof, of transit unavailability. All refund calculations will be based on unavailability in one-hour increments. This SLA does not cover outages caused by equipment and/or events not under the direct control of Skyway or caused by individuals not directly employed by Skyway. It excludes short periods of temporary service degradation, such as slow data transmissions. It does not cover outages due to scheduled or emergency network and/or facility maintenance by Skyway, which will be broadcast to all customers in advance. Any and all refunds to a customer will not exceed 35% of the customer’s recurring monthly charges for the month in which the refund is paid. A plumbing and heating supplier using a competing ISP approached us because they required more upload speed to serve their branch offices. The branch offices were complaining about slow speeds when downloading from the corporate servers. DSL is distance-sensitive and the head office was quite far from the Telus Central Office (or CO) which resulted in slow upload speeds. High Speed Cable was not available and although Fibre was an option, the cost to bring Fibre into their building was prohibitive. Skyway West proposed bonding 4 DSL connections with 1 block of Public Static IP addresses shared by all services. Our Bonded Internet also delivers no loss failover, meaning there is NO disruption in service if 1, 2 or even 3 of the connections fail. Terminal connections do NOT drop when an Internet connection fails, and although those using a Terminal or a Citrix connection might notice a very short delay but they will not have to reconnect. Our Bonded Internet service gave our new customer an Internet connection that was more that 4 times faster than their existing service, at a price far less than Fibre, including an SLA guaranteeing a day of credit for every hour of downtime. While they came to us looking for greater upload speeds, quadrupling their download speed was an unexpected bonus. Speed + Quality. 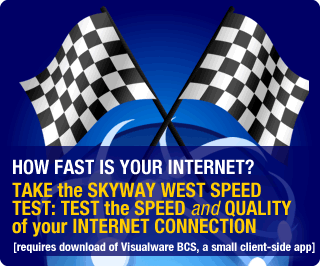 Our Cable service delivers blazingly fast speed as well as Skyway technical excellence. Business can now enjoy high speed access with permanent static IP addresses for a fast, reliable, managed internet connection.